This is a presentation for anyone who's ever held back. Employees: Your voice needs to be heard. So what's stopping you from speaking up? Research shows 5 common reasons people don't contribute their opinions in the workplace. We''ll tackle all five and review techniques for overcoming these barriers so you can find and use your voice. It's a great big, hairy, scary, complex problem. And it's yours. What do you do? Tune in for this webinar, designed specifically for HR and front-line supervisors. We'll give you some effective, fun new ways of looking at a problem from every angle and engaging others in collaborative problem solving. Our objective in this webinar is to help you build leadership capacity by improving your understanding of and ability to introduce and facilitate change. It’s important as a change leader to recognize what others may be feeling when there is an expectation of change. Join me to learn what’s happening when you introduce change, how you can communicate more effectively about it, and how you can lead change in an inspiring way. This presentation is about knowing what drives sales productivity and how to strategically pull the levers for a balanced and more predictable performance. We’ll review the top 7 Sales Productivity Drivers and the interplay between them. You’ll be able to diagnose which ones you need to work on for improved sales performance. Join me to identify which Sales Productivity Drivers need your attention and which ones can go on auto-pilot in your organization. Employee engagement matters. A lot! It's the key to improved retention, higher productivity and customer satisfaction, stronger revenue performance, AND increased profits. So how do you boost employee engagement and unleash all these benefits for your business? In this presentation, we'll review 10 proven strategies for boosting engagement. You'll leave this 45-minute webinar with specific action items you can implement immediately. People practices that pay off and an opportunity for HR to shine! Managing Work vs. Leading People. These are tough decisions and challenges that face Sales Managers every day. It's easy to get swept up by the tyranny of the urgent and the revenue pressures at hand. But leaders inspire others by focusing on the future and continually building toward something better. And you can, too. Join me to move past small-picture thinking and a singular focus on the here-and-now. Become more inspirational and more proactive with the tips and techniques from this presentation. Sales may be the very last thing you'd ever want to do. And it's not something you understand (or really want to!). Nevertheless, since sales is the engine of every business, it's important for you to know what it takes for the organization to succeed in selling. This topic might seem a little intimidating. It’s an important one, though, so we’re going to tackle it together! We'll start with a look at how businesses make money, and then we’ll shift gears to talk about how businesses report on the money they make. Your familiarity with financial terms and basic accounting methods will make you an even greater asset to your company and may make your job easier to do. Join me to learn the basic terminology and principles of finance. No matter what your job function, developing this business acumen will help you understand executive-level decisions and direction. It's the conversation no one wants to have. But it must be done. How can you deliver a difficult message without demotivating a seller? How can you speak directly and clearly so a seller will make the changes you need? We'll talk about the value of candid conversations and how Sales Managers should conduct them to maintain morale and boost sales effectiveness. Sales performance depends on sales people. Learn how you can be more effective in delivering feedback that changes sales behaviors and boosts sales productivity. You'll learn the 3W Feedback Model, a simple way to ensure that your feedback sticks. It's a profound exercise, naming and claiming your core values and articulating what you're all about in business. It has a profound impact when others see you consistently acting in accord with your principles. Join me for a step-by-step process to develop your own, powerful, philosophy of leadership. No one really likes it. Everyone dreads it. And most of us dwell on it after it happens. But you can become more confident, comfortable and effective in any conflict situation. 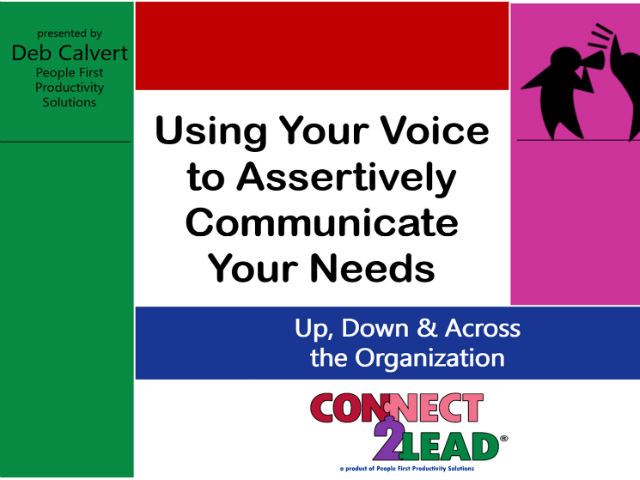 Join me for this webinar, designed specifically for supervisors and HR business partners who want to assert themselves without creating unproductive conflict. Sales Managers - join me for a discussion about how to set expectations that motivate sales professionals. We'll tackle the myths about sales management that interfere with goal attainment and reveal the secrets of sales motivation. Slow down that revolving door of talent! Keep the people you want to have on your team! How? That's the BIG question. And we're going to answer it in this webinar. We'll take a look at the research and best practices that make some employers better at retaining top talent than others. Spoiler alert: It's not because they pay more or have better free food in their cafeteria! What they've got is a higher level of employee engagement. And you can have that, too. There's a reason that human capital tops the list of C-Suite concerns in 2019. And we're going to cover that, too. We'll address some of the myths and mis-perceptions that get in the way of truly engaging and retaining people in your organization. You'll also receive a free checklist for daily engagement activities that you can distribute to all your managers. Don't miss this presentation from Deb Calvert, president of People First Productivity Solutions -- we can help you build organizational strength by putting PEOPLE first. As a manager, supervisor, or HR business partner, delivering the message isn't good enough. If you want to be effective and get things done through other people, you've got to make sure your messages are being received. AND that they're being understood as you intended them. That's a lot of responsibility! But it's what will make your job much easier. It's what will make you more effective, more credible, and more capable of reaching your business goals. Join me to learn the secrets of making sure your messages are coming through loud & clear. The most effective Sales Managers understand that managing sales is only part of the job. To succeed long term and build the business, you can't ignore the other part of your job -- leading people. Join me to learn how you can out-perform your peers, delight your customers, and support your team members in ways that really matter. The employee survey came back with some concerning numbers. The managers with employees who are less engaged need to figure out how to turn it around... But where should they begin? How can you help them pinpoint the changes needed and to move away from externalizing the blame? Join me to talk about some practical support you can offer. As a Sales Manager, you can make an even bigger impact when you learn how to cross-apply your selling skills. Needs assessment, proposing solutions and overcoming objections are all a part of sales coaching, too, so you've got a fine foundation to build on. It's simply a matter of shifting your delivery to meet the needs of your new customer (the salesperson!). Join me to find out how to make the shift that will make an even bigger impact on sales. Can't live with 'em, can't live without 'em. But something's gotta give because other employees are having a hard time interacting with your technically gifted experts who aren't exactly "people persons." Let's talk about some strategies for supporting the team and developing interpersonal skills to keep the peace. Fascinating finds from observations of and interviews with 7 types of problem employees... You've probably got at least 1 in your organization. This workshop is for managers and business partners who aren't quite sure what to do next with the renegades, chronic complainers, inconsistent performers and others that make your job more challenging. Join me for a different perspective, one that comes directly from these problem employees. We build organizational strength by putting PEOPLE first. Thought-provoking webinars about Sales, Leadership, Employee Engagement and Team Effectiveness. Our research and topics focus on getting from people by giving more of the right stuff to people.